AR Navigation gets Pete on the Right Track! Sorry folks, Pete was in Kawasaki, Japan last week custom installing a Thule Fairing. I love Japan and had a little too much sake to write up a blog, but I’m back now. Heading to Texas this week to compete in a 12-hour adventure race. It’ll be a blast, although I’m a little rusty with my navigation skills and you know how important navigation can be in an adventure race. Lucky for me I can get in a little tabletop navigation practice before the race. 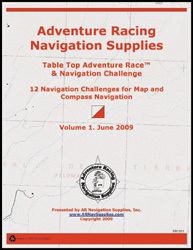 AR Navigation Supplies makes these pretty sweet books for brushing up on the nav. skills, plotting bearings, route choice, UTMs etc. I’m also going to try the MBO-2 Rotating Mt. bike Map Holder. I’ve always gone old school, with a map case dangling from my neck, but thought it was time to make an upgrade. Well, that’s it for this week. Kampi and here’s to hoping I don’t get too lost.